My Uncle Bruce died this week. A sad time for sure! But there is no question the man left his mark on life and those who knew him well. He loved his toys and he loved dessert. Bruce could keep you fed, occupied and entertained for hours. I'm sure he remembered absolutely everything and if he didn't, he probably knew a guy who did. Now, just for a moment, imagine being a kid and having a Grandfather like this. Here's the story of Uncle Bruce as told by his son Bob to a reporter from the Brantford Expositor. Bruce Essery had a passion for collecting. He spent a lifetime gathering things that he loved - cars, farm equipment, memorabilia from gas stations, antique radios, cash registers, milk jars, pottery, signs, licence plates, engine parts. Some of it beautiful, like his 1950 Studebaker Starlight coupe, and some of it quirky, like the old clown bike with the upside-down frame that his son, Bob, used to ride when he was a kid. But as he neared 90, Mr. Essery thought it was time to part with some of his prized possessions, which by now packed several buildings. He planned a giant auction for June 18. Bob said the auctioneers took a look at the cache and declared it a sale of a lifetime. "The auction will go ahead but he won't be there," said Bob of his father, who died on Monday at age 89. "Those were his wishes and that's what we're going to do." 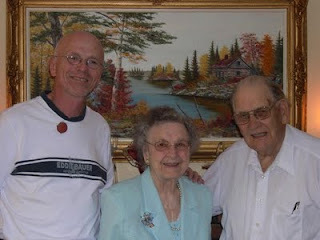 Bruce Albert Essery was born on Sept. 14, 1921, in Brantford. He grew up on Paris Hill Avenue where he was neighbours with a young James Hillier. When he finished school, he took a job with Coca-Cola as a special salesman. One of his duties was to travel to the homes of prize winners to ask them skill-testing questions. "I don't think anybody ever lost with him," said Bob. In 1944, Mr. Essery married Doris, calling her his first collection. The couple had two children: Bob, and a daughter, Lynda. "He was a great father and one of the best men you'd ever want to meet." Mr. Essery served in the Second World War, teaching other soldiers how to drive Bren Gun Carriers, and then returned to his job with Coke, where he worked for 28 years. When he retired, Mr. Essery earned his real estate licence. For years, he was a successful agent with Iezzi and Iezzi Real Estate. Mr. Essery began collecting in his mid-20s, gathering, over 65 years, things he loved but couldn't afford earlier in his life. Among the dozen cars he owned when he died is a Bricklin SV-1, a gull-wing door sports car manufactured for just two years in New Brunswick in the 1970s. Only 2,800 were built. Mr. Essery travelled to the factory and bought two of them off the line. There is also a 1948 Pontiac Silver Streak, a bright red 1961 Rambler convertible, and a 1953 Rolls Royce Silver Wraith. 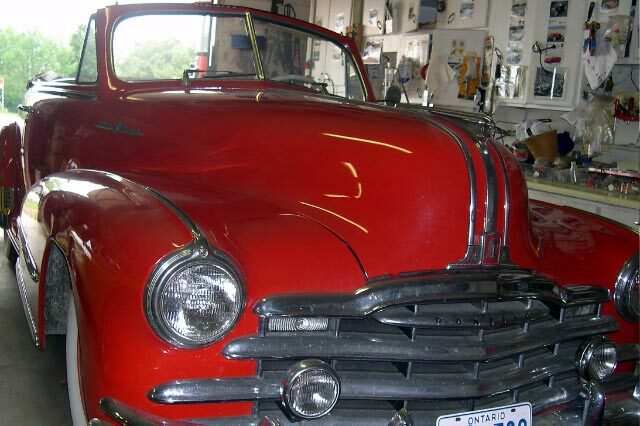 Then there is the 1939 Packard convertible that Mr. Essery bought from a fellow in Chicago. Somehow, Col. Harland Sanders of Kentucky Fried Chicken fame was familiar with that particular car. He looked up Mr. Essery some time in the mid-1970s to see if he'd be interested in driving him around when the colonel, acting as a goodwill ambassador for KFC, came calling on his local chicken franchises. For several years, Mr. Essery, at the wheel of the Packard, was the colonel's local driver. And, over the decades, his collections continued to grow. He gathered blacksmith tools, antique buggies, sleighs and tractors, pinball machines, old gas pumps and advertising signs, steam train whistles, old airplane propellors, Victrolas, antique barber's chairs and dentist equipment, and a vast collection of Coca-Cola memorabilia. He especially loved items that were Brantford-built or had another local connection. He accumulated hundreds of thousands of pieces. "He always loved to restore and fix things up," said Bob. "Everything meant something to him." Just a few weeks ago, Bob said he father was out in the garage tinkering with the Rambler. Bob often accompanied his dad on his treasure hunts. "He could tell you where he bought everything, how much he paid, and what it was worth. "He and I did a lot of stuff together. We had a good time." The sale will be handled by Sackrider Auctions and Shackelton Auctions. Mr. Essery was one of the founding members of the Long Point Region of the Historic Automobile Society of Canada, and long-standing member of the Iroquonic region and many other car club committees. He loved participating in community events, parades, car meets and sales. Mr. Essery is survived by Doris, his wife of 67 years, son Bob and his wife, Sharon, daughter Lynda and her husband Wynn McDonald, grandchildren Sheryl, Lisa, Stephen, David and Lindsay and great-granddaughter Kyleigh. Uncle Bruce inspired me to become a classic car owner and a collector of my own cool stuff. I have always said if I had more money and a bigger garage like my Uncle, I'd be dangerous. His passion for old cars became a business. I'm sure he bought and sold hundreds and hundreds of vehicles over the years and boy did he have some beauts. A '57 Cadillac convertible once owned by Elvis Presley, a '59 Cadillac convertible once owned by Marilyn Monroe, everything Ford ever made from the dawn of time through the 60's, Packards, Ramblers, Studebakers, Cockshutt Motors tractors, Chevy's, Rolls Royces and even a modern-day replica of an Auburn Speedster. My favourite though he still owned and is to be auctioned in the big sale as referenced in the newspaper story above, a bright red, 1948 Pontiac convertible in original condition. Like I said, if only I had more money and a bigger garage.